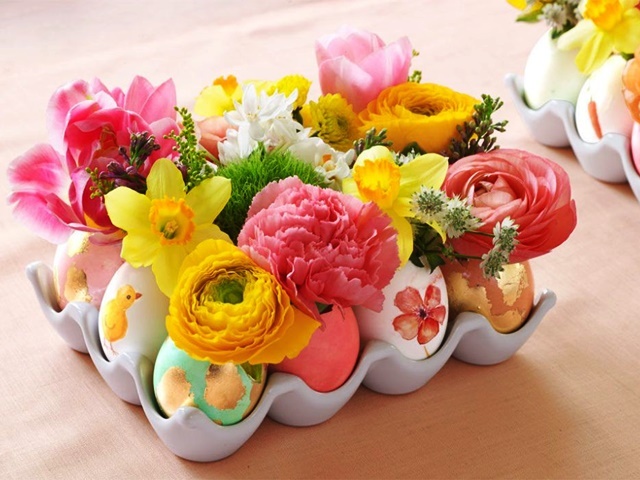 Anything can inspire us to do a stylish nail art such as – from natural climatic sceneries to small cup and saucer design. 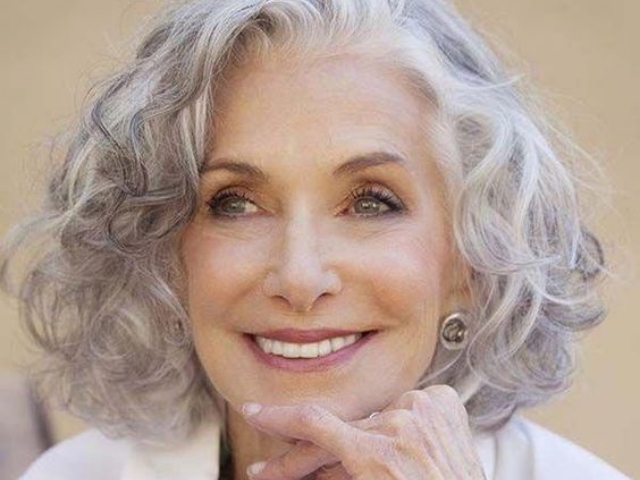 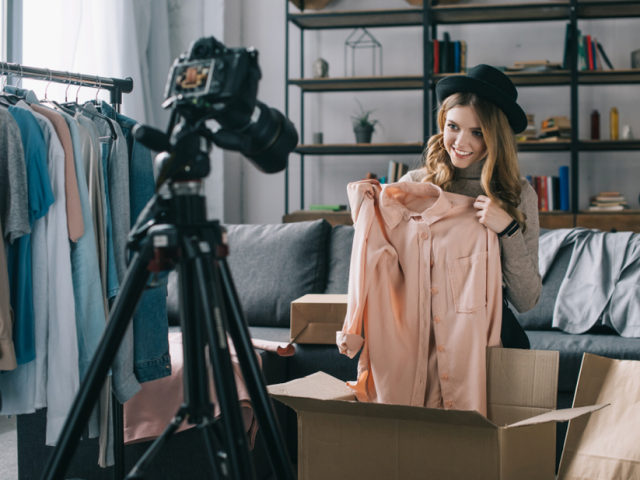 The inspiration is present everywhere even in a very small form, but to choose the right one for you is your first priority to look awesome and to leave a never ending effect on others people mind. 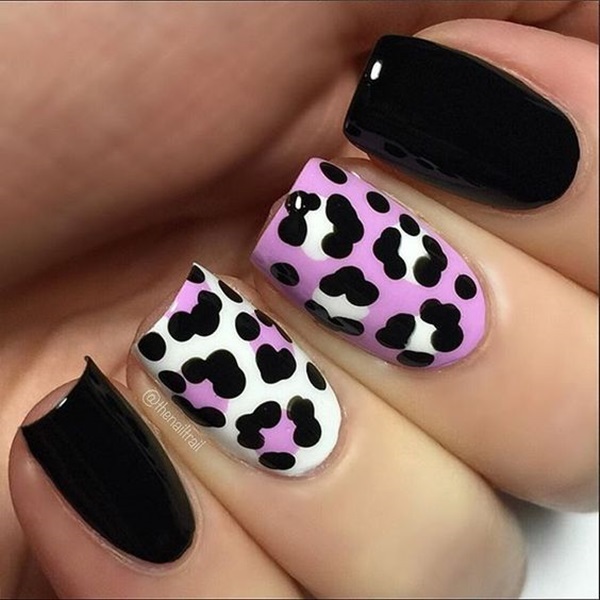 In the present scenario, animal themed nail art are gaining lot of importance among young girls and women of all age group as they never prefer to compromise on their look whether it’s in their budget or not. 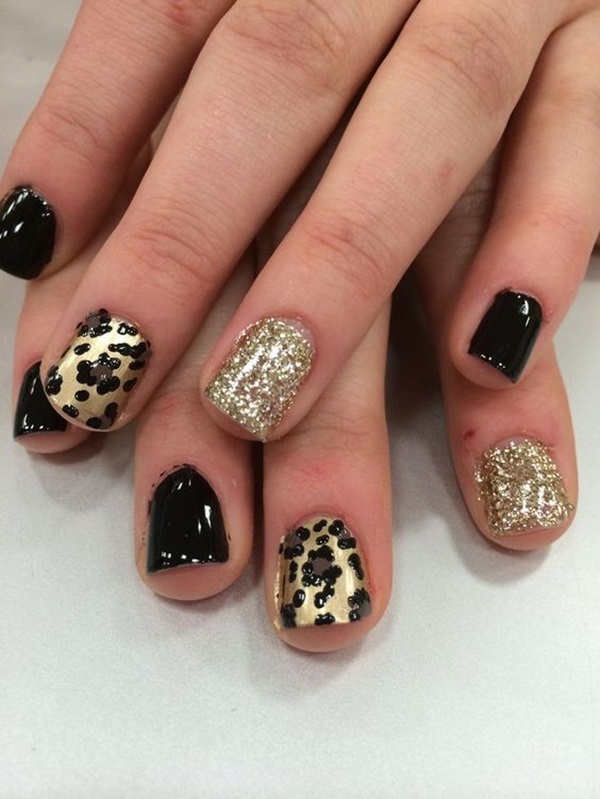 As a result, nail art is spreading like an epidemic. 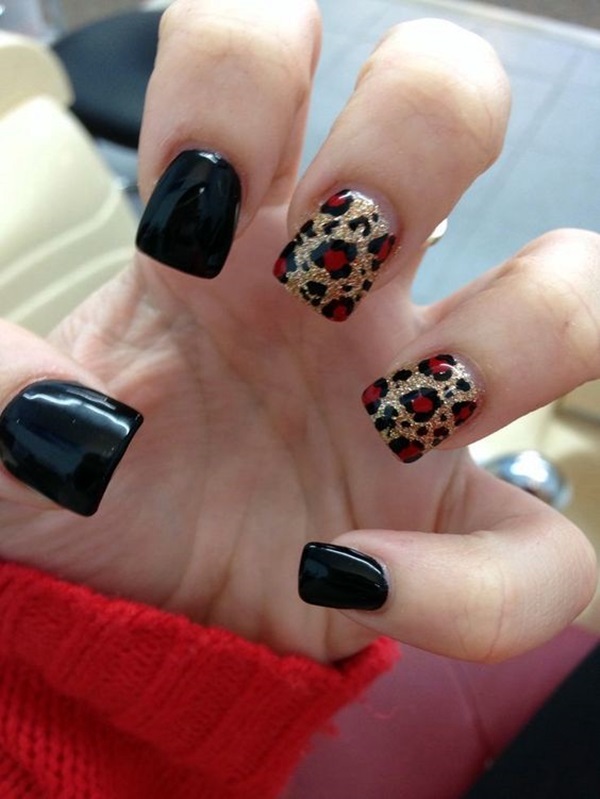 We like to direct your concentration toward a very unique and stylish nail art category which is Gel Nails designs and Ideas. 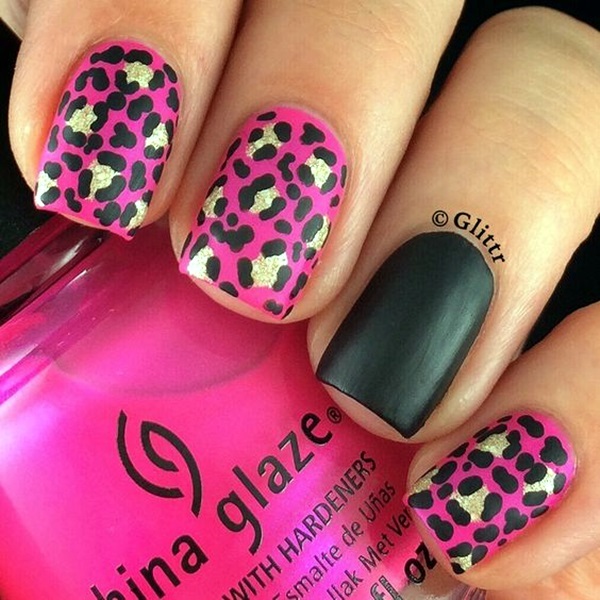 Leopard prints nail art is one such popular idea worth coping among all designs inspired by animals. 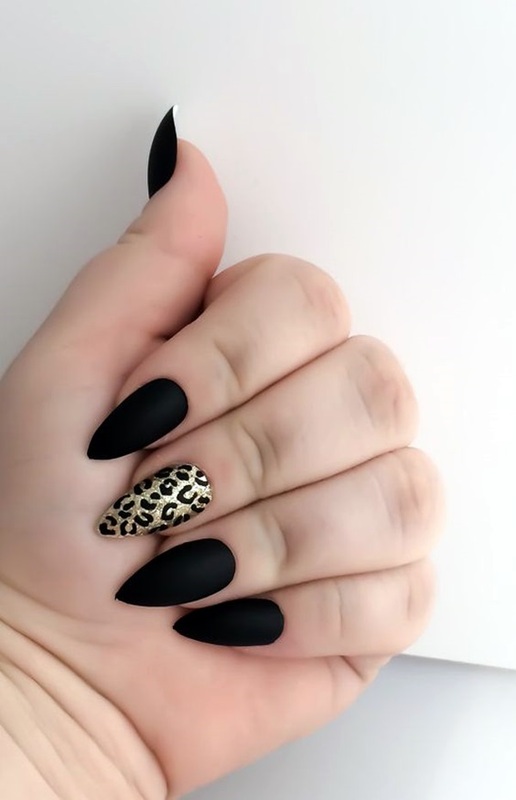 Leopard prints serve as a great way to express your love towards wildlife and this nail art can be done very easily using only three polish colors. 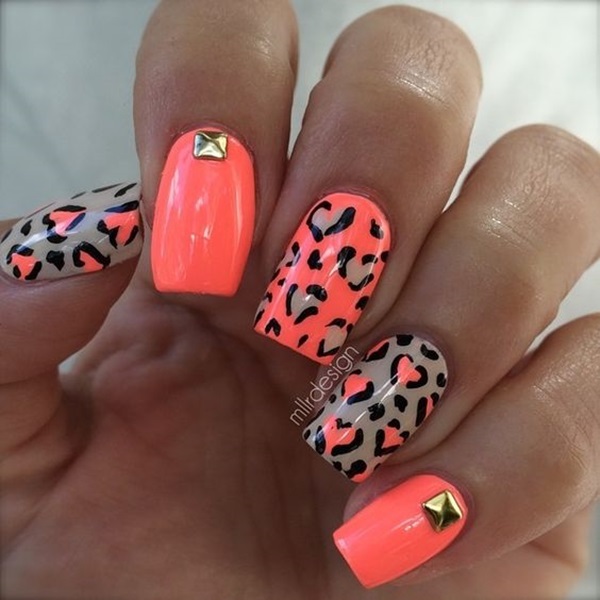 It suits any nail shape and look absolutely stunning on both short and long nails. 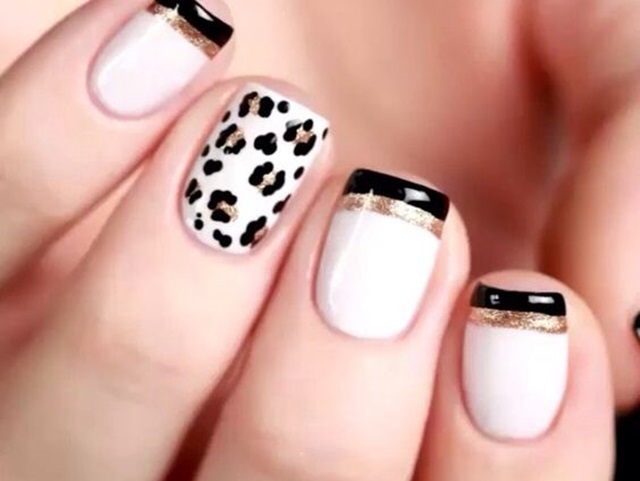 If you are going to a wedding soon than you must check out some Wedding Nail Art Designs, they are usually embellished with stones, studs and precious pearls. 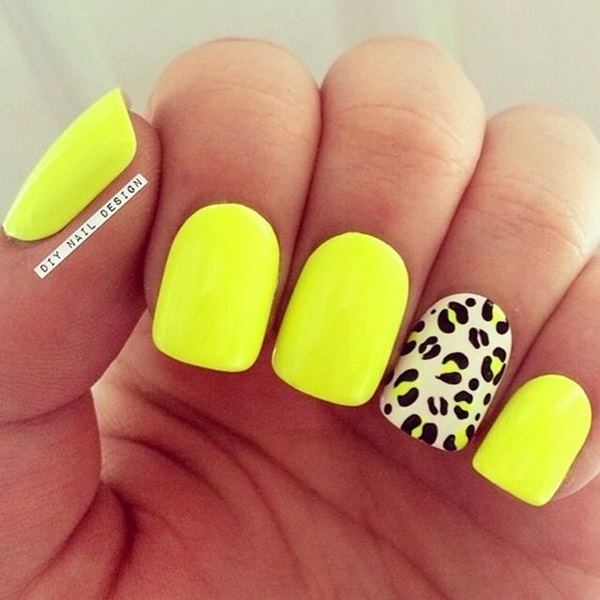 Neon shade leopard prints nail art look fabulous in hot summer days. 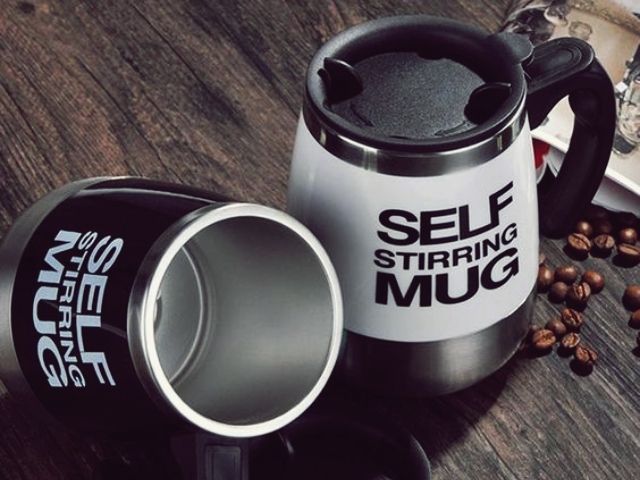 The design is quite simple and easy to create in just 5 minutes. 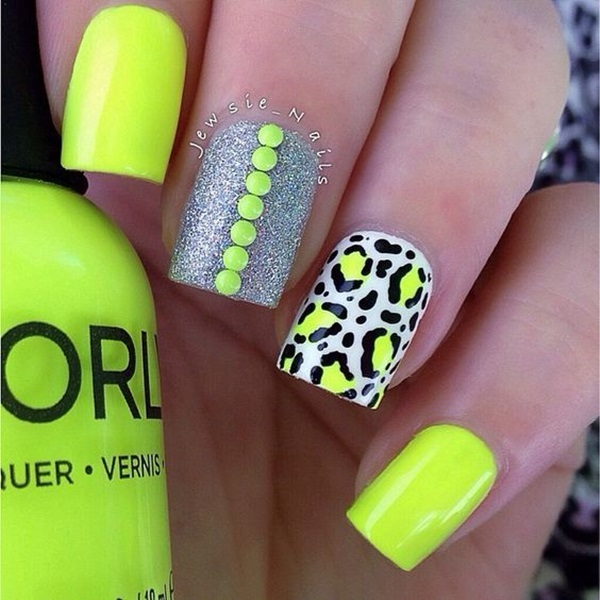 To get this look, simply paint the base with white color and add some dots using different neon shades at a distance. 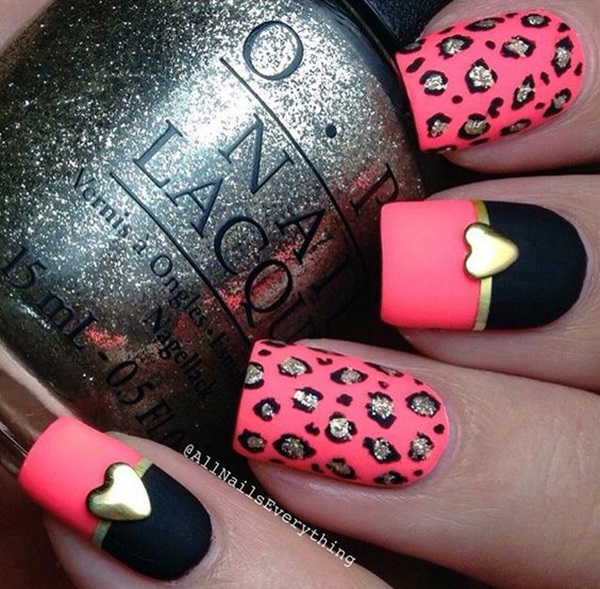 For highlighting the dots, outline the dots in ‘c’ shape strokes with dark color. 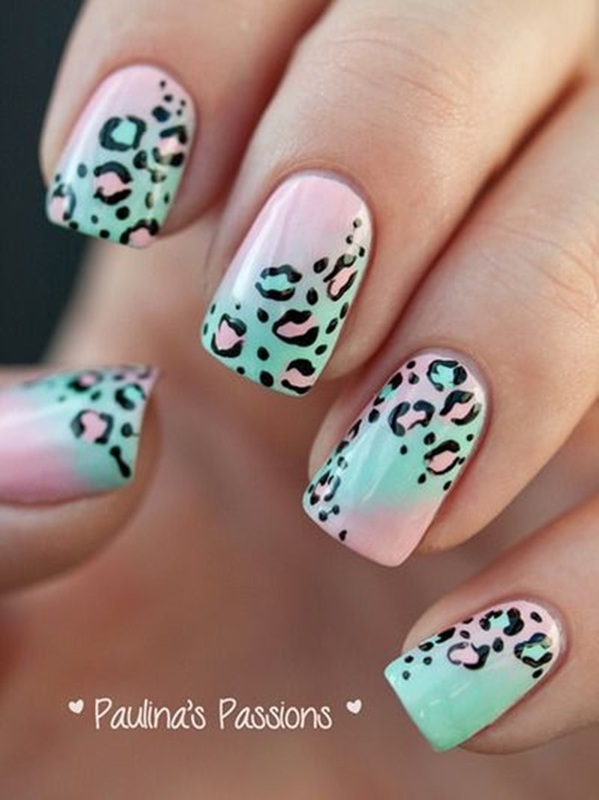 Leopard prints using multiple watercolor shades is an innovative way to make your hand fingers look different and stylish from others. 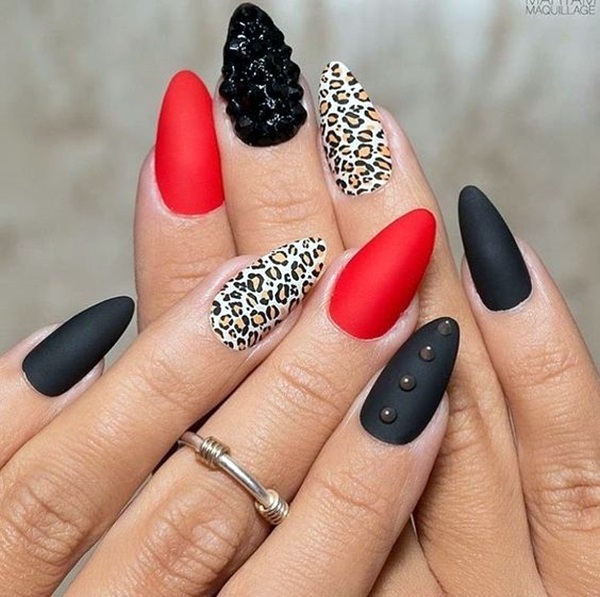 The first thing you do is apply a base coat of bright watercolor shades and then create leopard skin like spots in the middle of nails using black shade for bold effect. 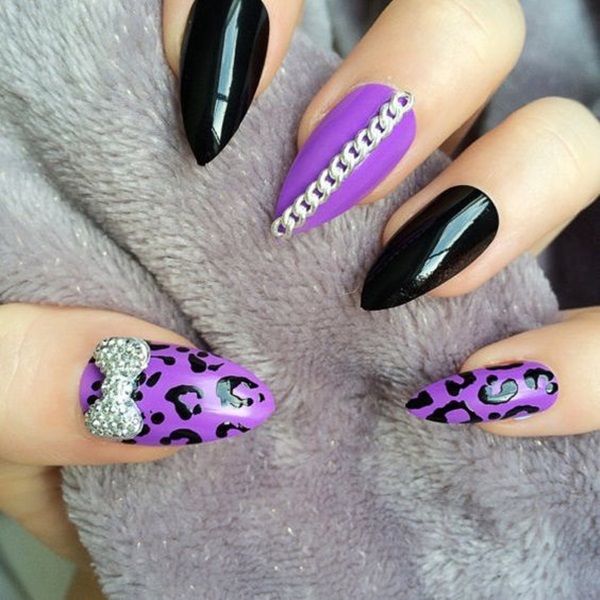 To give a complete change to your look, you can try the beautiful art of creating leopard print like spots on your big nails using a softer palette of purple shades. 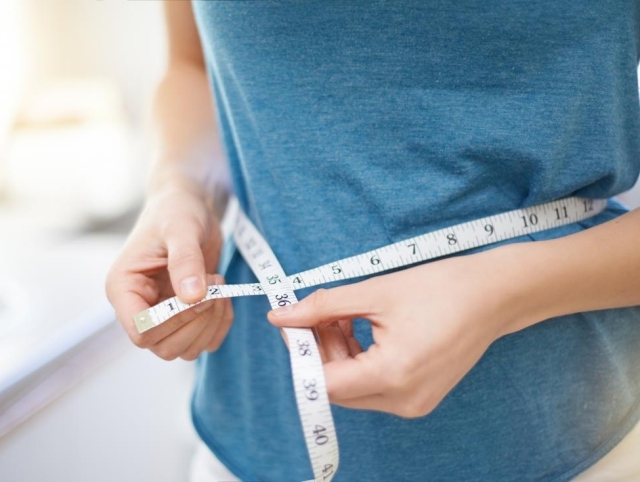 You can use the clear, transparent polish as the base coating. 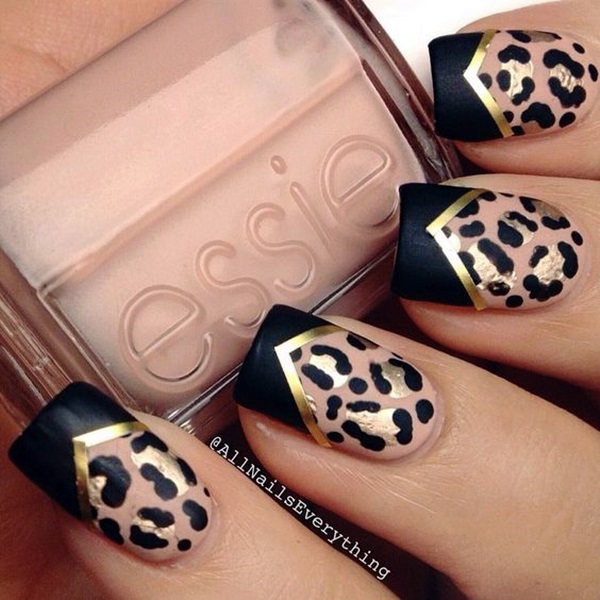 This leopard nail art looks super cute and completely different on long pointed nails. 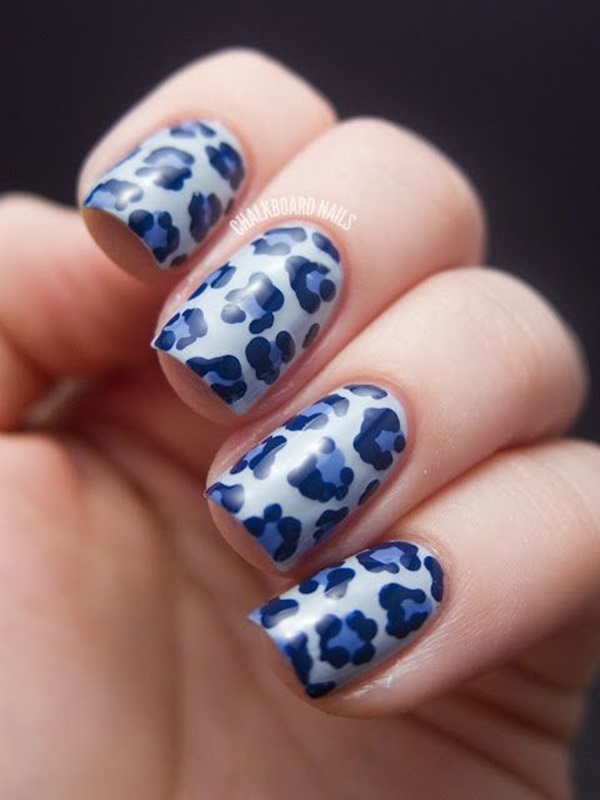 This denim leopard prints nail art looks unique with all nails painted with light blue color and adds a cute quotient to the whole nail art. 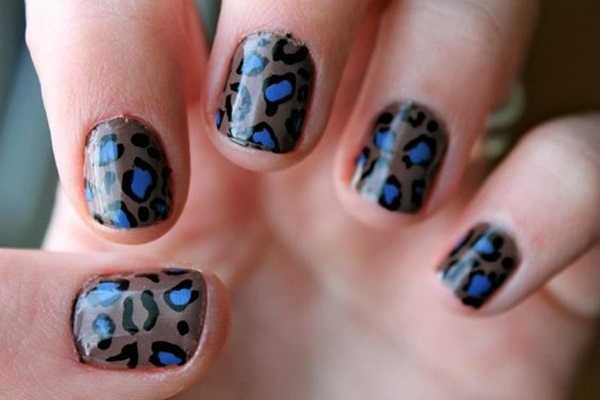 This leopard denim effect will be achieved by using dotted tool to make dots in the centre with dark blue shade. 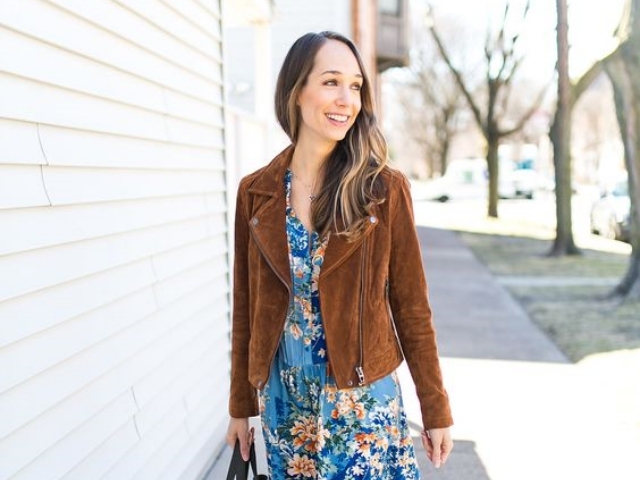 The light background color at the base compliments the pattern. 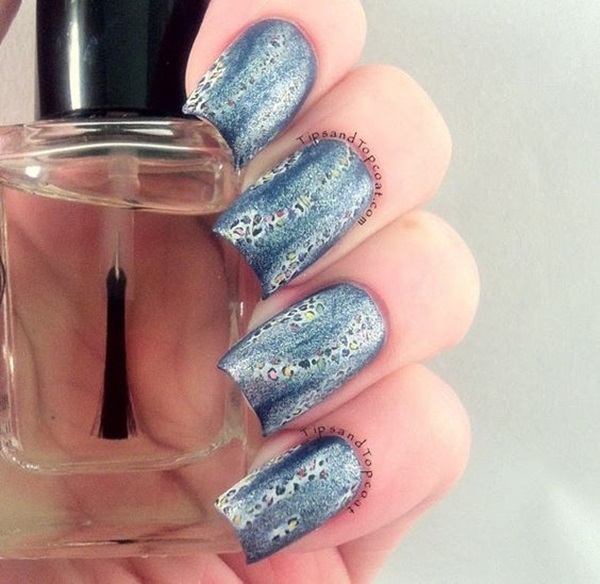 You should also try blue color nail art, trust me, you will love these stylish Blue Nail Art Designs and Ideas as well. 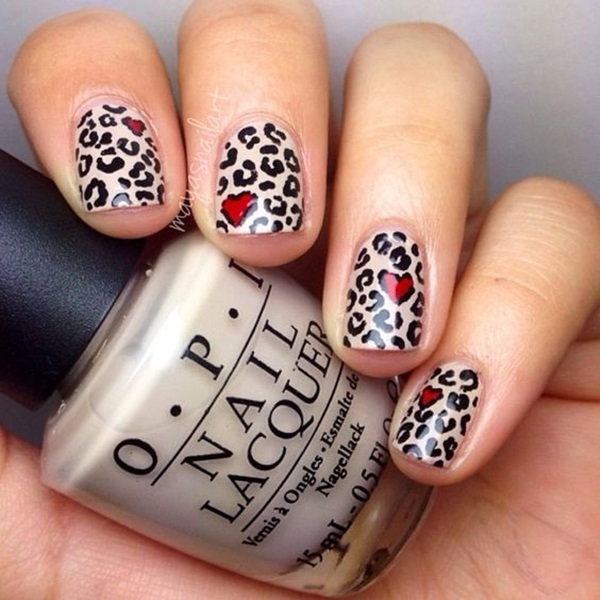 The leopard print heart in the center of the nail looks adorable on girls who are extremely fond of wild animals. 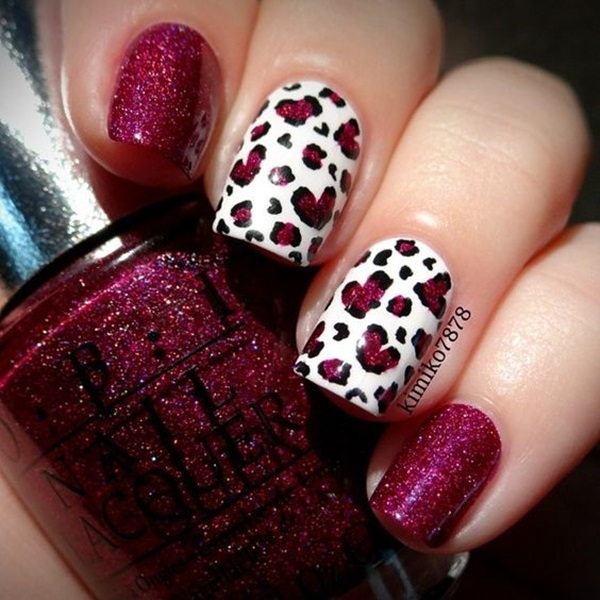 This nail art shows the qualities of a kid hidden inside you and has now become a fashion statement. 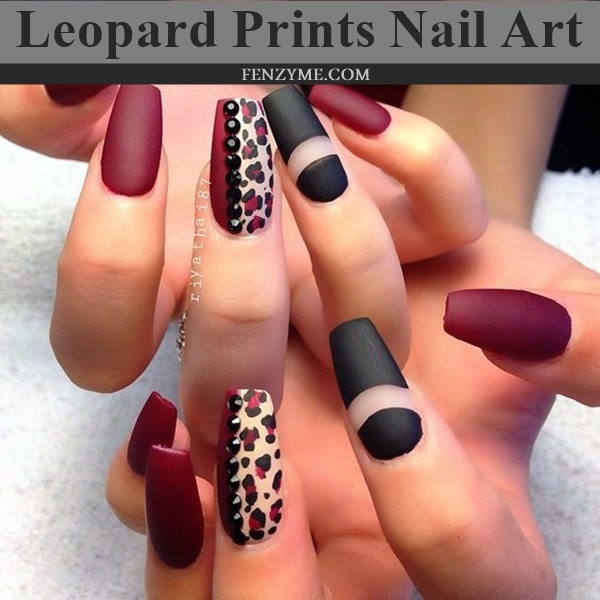 You just have paint the base with light cream color and draw heart in the middle with a combination of black-brown leopard prints. 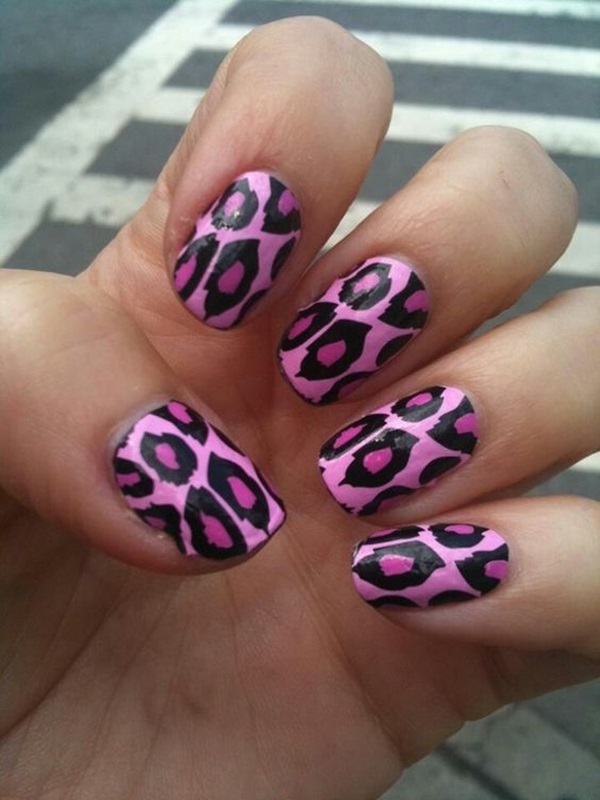 The design looks good if you are going for an animal themed party with either your friends or office colleagues. 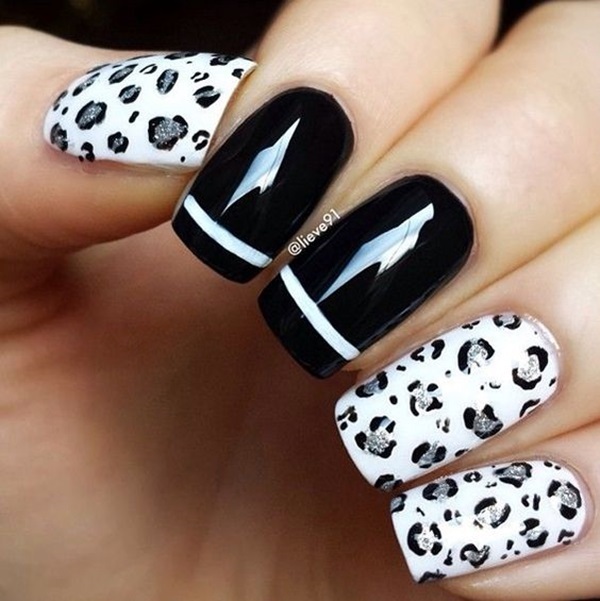 This is one of the favorite nail look of almost all the animal nail art lovers. 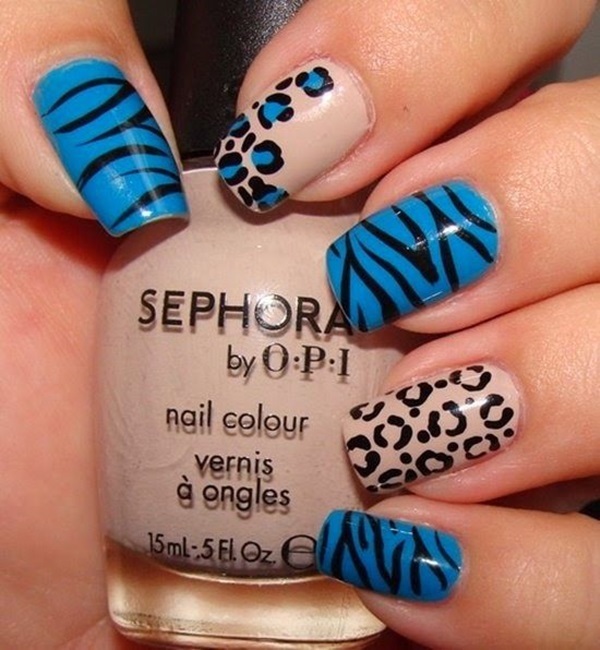 To do your nails in antique leopard style keep the base complete white and use tooth pick for clear edges. 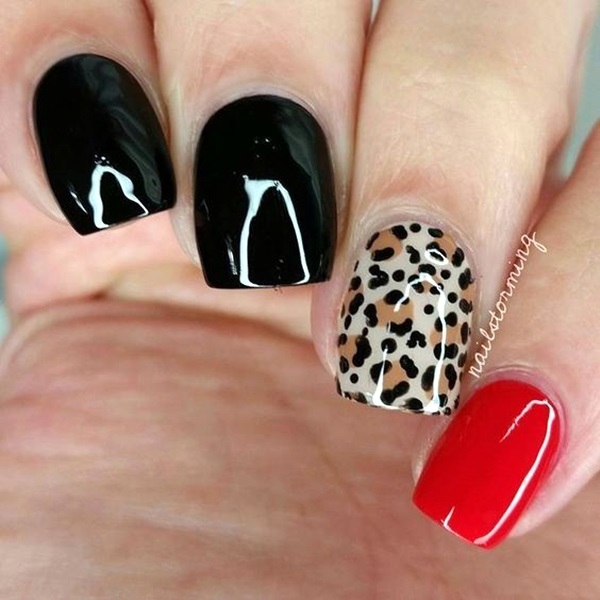 Then, with a combination of black and red colors draw leopard skin type horizontal and vertical patterns on your whole nails leaving some gap. 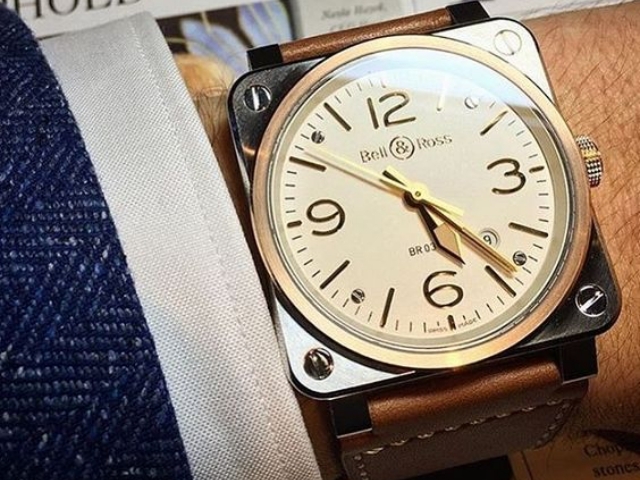 The design looks superb if done neatly. 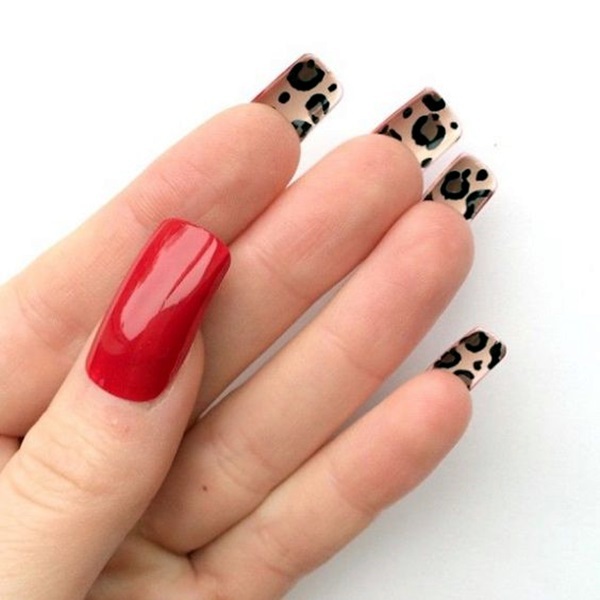 It’s fair to say at the end that you can create as many leopard prints nail art design on your fingers to look cute, funky, playful and stylish.